Take your brunch to the grill! 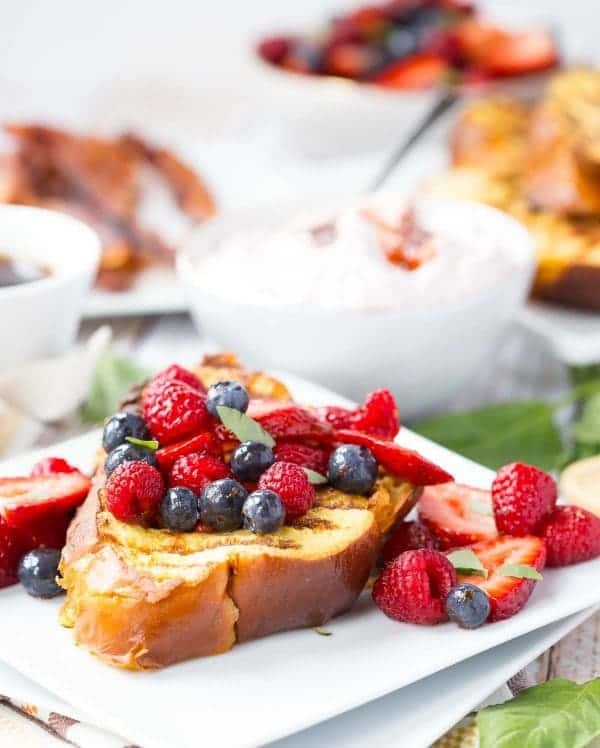 This grilled french toast and its strawberry basil cream cheese stuffing will be the perfect brunch centerpiece. Want to hear a funny story? It wasn’t too funny at the time but you have to laugh at life. A couple of weekends ago, I had 3 or 4 recipes I wanted to develop on the grill. We hadn’t grilled yet this season, so we got the grill out, uncovered it and it was covered with mold! Moooolllllld. Gross, I know (sorry). So we burned it all off, cleaned it really well, and then burned it all off again. By this time, it was raining. Yep, raining. Thankfully I had begun some initial recipe development using my grill pan inside, but still. One of those days where the stars just didn’t seem to align….yeesh! Oh wait, there’s more! By dinner time it had brightened up, so I asked Ben to turn it back on so we could grill some chicken (also a recipe for Rachel Cooks). He went to turn it on, and guess what? OUT OF GAS. Throw me a freakin’ bone! Back to the grill pan…. I teamed up with Door to Door Organics once again to bring you this amazing French toast. I was challenged to create a brunch item using the grill, and let me tell you, I might never go back to grill-free brunches! I bought all the ingredients for this brunch through Door to Door Organics, meaning they were delivered right to my door. I don’t know about you, but when I’m entertaining or even just planning meals for the week, there is always so much to coordinate and so many lists happening. One of the things I always have to coordinate is when I’m going to swing by the grocery store to pick up all the ingredients for the food I’m preparing. The great thing about Door to Door Organics is that it comes right to you! It’s a huge stress reliever and the quality is insanely consistent and impressive, so you can be confident that you won’t be making any last-minute trips to the store. 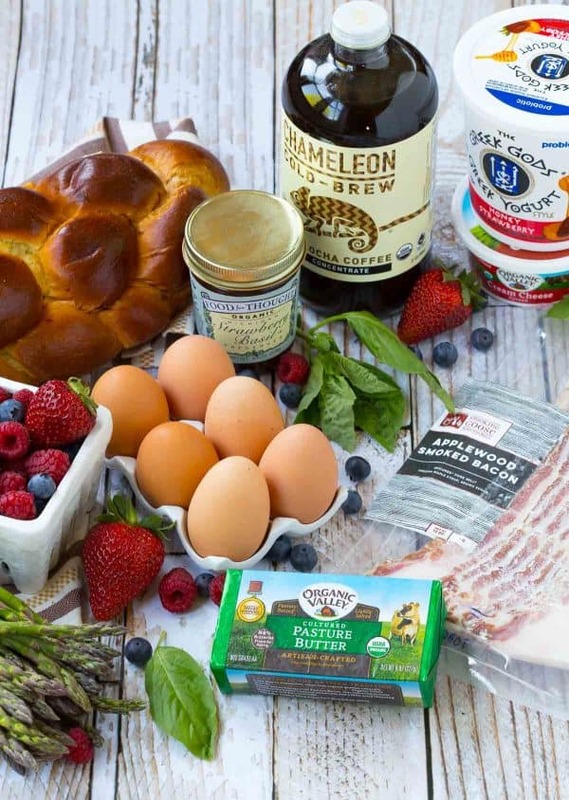 Freshly baked bread, organic berries and vegetables, great bacon and eggs, and even cold-brew coffee. Shopping done, from my computer, in my sweat pants. What’s better than that? I’ll be honest, when Door to Door Organics approached me about this project, she mentioned stuffed french toast and it kind of stuck with me. When I preparing my order online and finalizing my recipe idea, I spotted the strawberry basil preserves, which I’ve had before and LOVED. Once I spied those, there was no turning back from this recipe. I love the combination of strawberry and basil, in fact, I’ve made my own strawberry basil freezer jam. I’ve also stuffed strawberries with basil whipped cream which you just HAVE to do this summer! They are so delicious. I carried on with my shopping and saw the challah from Zingerman’s (aka heaven on earth). That solidified the grilled french toast in my mind, there was no turning back. Into my order went eggs, milk, tons of fresh berries, fresh basil, and cream cheese. I decided to round out my brunch with some fresh asparagus, bacon, and cold-brew coffee. And some yogurt for good measure. The grilled french toast is really simple to make. You’ll want to slice the challah into nice thick slices, about an inch thick. 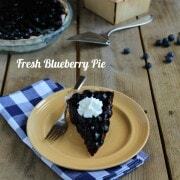 Then, carefully with a sharp knife, slice a hole in the middle of the slice, making a pocket for the cream cheese. I flavored plain cream cheese with the preserves and stuffed the bread with that. The stuffed bread goes into a large baking dish until you’re done stuffing each piece. Then you pour your egg and milk mixture over the bread, letting it soak it all up. All that’s left to do is grill it! You could definitely cook it on a griddle as well, but grilling it gives it such a great flavor. You have to try it! For the perfect brunch centered around the grill, I also grilled asparagus and bacon. You could round it out with some other great brunch offerings like a yogurt parfait with shortbread crumble, a beautiful cocktail. If you want to add more protein to brunch, consider a frittata, they’re very easy to make and taste great at almost any temperature. A white pizza frittata or a leek and asparagus frittata are both great vegetarian options. Oil the grates of your grill and preheat grill to medium-low, or about 250-300 degrees Fahrenheit. From the bottom of each piece of bread, carefully slice a pocket into the middle of the bread. You don’t want to cut all the way through, but the opening should be large enough to get a knife with filling into the bread. 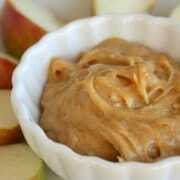 In a small bowl, mix together cream cheese and 1/4 cup preserves together until combined. It’s okay if it looks a little chunky. Evenly fill the bread slices with cream cheese mixture. Place filled bread into a large pan (at least a 9×13, larger if you have it. In a large mixing bowl, whisk together eggs, milk, honey, and vanilla until combined. Pour over filled bread. Grill the french toast on the preheated grill over direct heat for about 5 minutes on each side or until golden brown and cooked through. If it’s browning too quickly, move it away from the direct heat and to the indirect heat. Meanwhile, mix berries and 1/4 cup preserves until berries are coated with preserves. 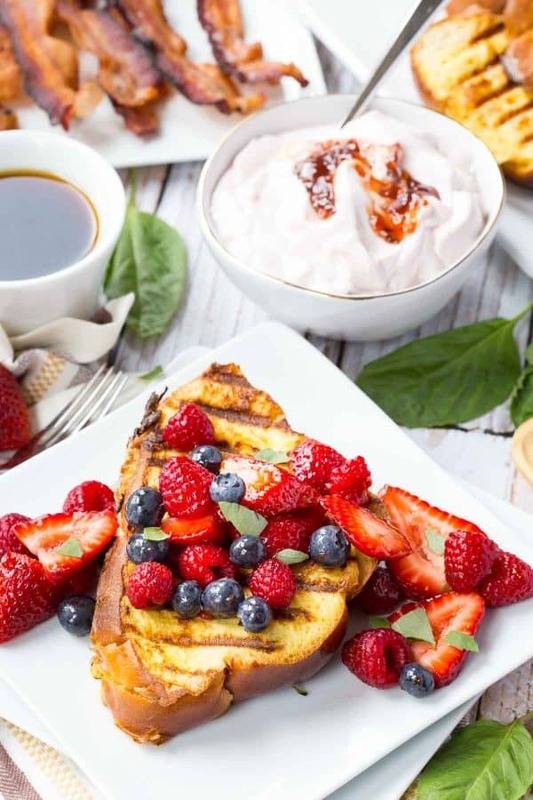 Top french toast with berries and serve! 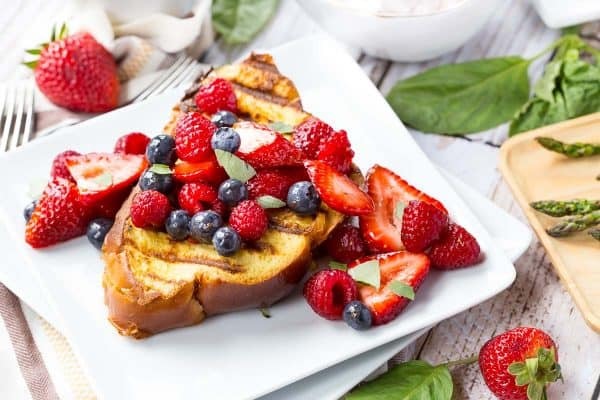 Note: You’ll likely have extra berries after topping the french toast – they make a perfect fruit salad on the side. Verdict: LOVED this! 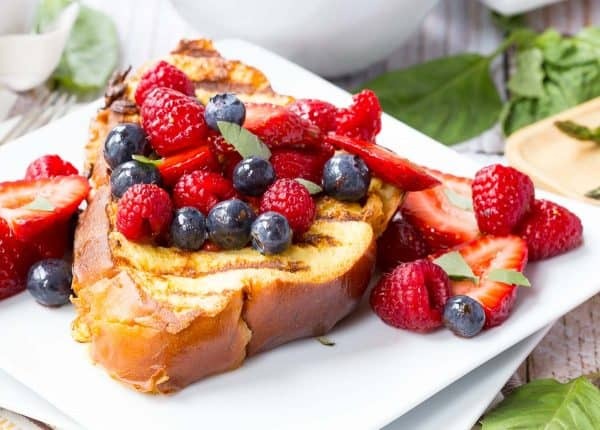 I loved the creamy strawberry basil filling and the topping was so fresh and flavorful which cut the richness of the grilled french toast perfectly. Husband’s take: He’s not a huge cream cheese fan so I caught him leaving behind a bit of the filling, but he still ate at least 3 servings of this french toast (not all at once). Changes I would make: None! But feel free to try different flavors and experiment with different stuffings. Difficulty: Easy – moderate. The bread gets fragile when soaked with the egg mixture so you just have to be gentle moving it to the grill. Also be gentle when stuffing the bread, take your time and make sure to use a sharp knife when cutting a hole in the bread. I have never thought to grill it but now I have to try asap! Love how crispy it must get on the outside. Grilled French toast?? What a fun summery breakfast idea! I love using challah for French toast. The filling is just icing on the cake. Yum! Glad that you got the grill cooperating, because this recipe is too gorgeous to miss! I want to wake up to this french toast! I believe I just found Sunday brunch! My family is going to wake up to some serious deliciousness. Oh, girl. 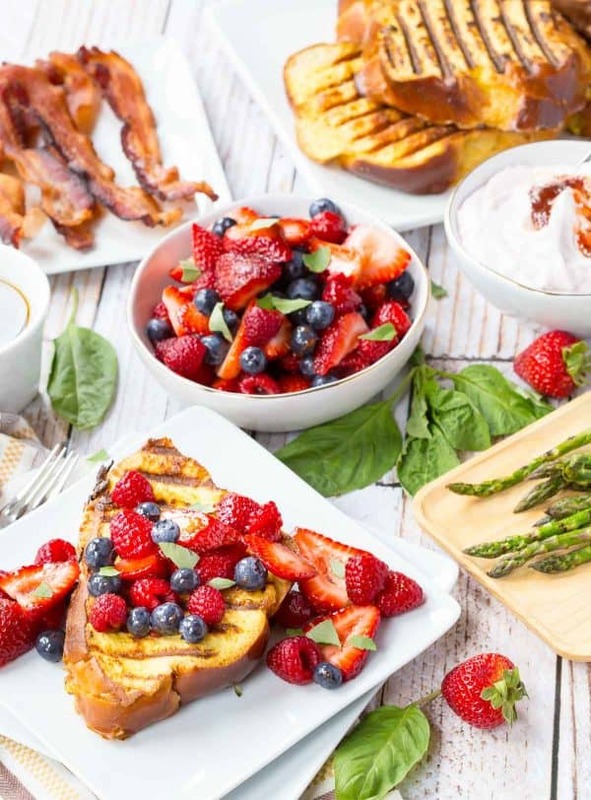 Any kind of French Toast … but with strawberries and basil? And grilling it … perfection! Okay, I am totally enamored with your twist by using the grill! I did a grilled strawberry pound cake last year that was awesome, but this sounds even better. And having all of the organics delivered? That is what’s right with the world right there. RIGHT?! Between Door to Door Organics and Amazon Prime Pantry, I barely need to leave the house. I love America. 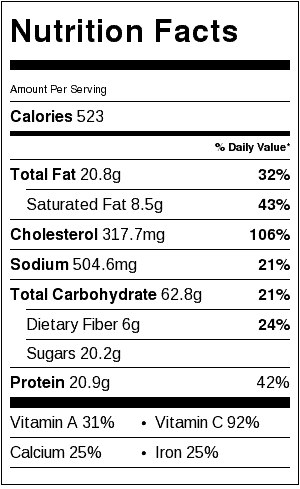 PS: Strawberry pound cake sounds amazing! This makes me want to plan a fun brunch real soon! Well, I know what I want for brunch this weekend!! Love these flavors! Such a fun way to change up French toast. Now *this* is how you do brunch! I never think of grilling brunch – so going to try this! 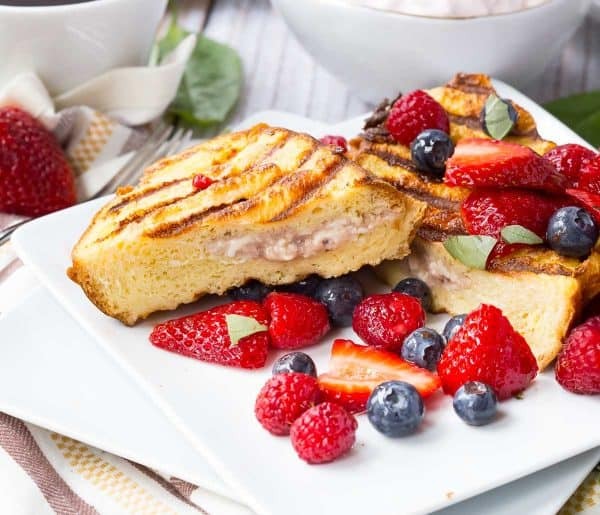 Grilled French Toast is absolutely genius! We are obsessed with Door to Door Organics and have been using them for our produce for years! Such a quality company. It is SUCH a great company! I would make grilled pineapple and yogurt parfaits! Agh! Damn mold! I am so sick of it, haha. I’m from Arizona where we don’t have much mold thanks to the dry weather (but dust covers everything) so now on the east coast mold is my worst enemy. In any case, this french toast looks fantastic. I’ve never had cream cheese with it but it sounds divine! SUCH a gross thing. I hate mold. You need to try cream cheese stuffed french toast….total game changer! I’ve never made brunch on the grill before, but it sounds like a great idea! I think I’d like to grill up some veggies for breakfast tacos. This sounds absolutely awesome! 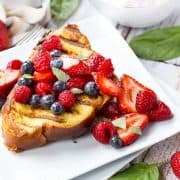 I love the combination of strawberries and basil and can’t think of a better way of incorporating it into breakfast than in this delicious looking French toast. I’ve never tried grilling french toast but I’m always up for something new. Pinned! GRILLED french toast?! How AMAZING is this!! I lovelovelove strawberries and basil, so this is calling to me! Pinning! Oh darn! Hopefully they’ll expand to your area sometime soon! This looks Amazing! I would have to try and make it Gluten-Free, though. I did not see how to enter. Did I miss something? It’s at the very bottom of the post – you might need to try on desktop if you’re on mobile. Let me know if you still have issues. Good luck! How gorgeous is this French Toast?! Love!!! I don’t normally use my grill to make brunch, but I’m going to start! Your french toast recipe will definitely be on my favorites list! I’d like to make a breakfast pizza on the grill!